As modern horsekeepers, we live in fortunate times. Equine health care options that were unavailable just a few years ago, both conventional and complementary, now exist for many conditions. Due to advancements in science, technology and medicine and the “rediscovery” of traditional methods, horses are living longer, healthier lives. Many horses are now overcoming conditions that once were considered debilitating or career ending. Traditional Chinese Medicine is one such option, now widely available, that offers health care opportunities and wellness tools for the modern horse owner. Some techniques, like acupressure and simple massage, can easily be performed by horse owners themselves. 3) Herbal medicine: treatment with herbs, plants, minerals and other natural substances, both orally and topically. In the TCM philosophy, horses are treated as unique beings, viewed within the context of their environment, diet, health issues, emotional state, stress and work, rather than just a set of symptoms. This whole horse perspective is what differentiates TCM from conventional methods of treatment. All three TCM modalities share the common goal of enhancing health, well-being and performance through the balancing of yin and yang as well as qienergies of the body. The concepts of yin and yang are at the basis of TCM theory and practice -- they are basic forces that comprise every aspect of the body. The yin and yangaspects of TCM are often challenging concepts for western minds to embrace, but very simply: yin and yang energies are paired opposites, mutually dependent on each other. By partnering, they create a whole. Yin and yang are in a constant state of flux. When there is an excess or deficiency of either yin or yang, the system becomes unbalanced and disease occurs. When yin and yang are balanced, there is life and qi flourishes; when they separate, death occurs. While conventional veterinary medicinal treatment is your first choice in the case of life threatening illness, injury or colic. TCM based treatments are a reasonable choice for less serious or chronic conditions. 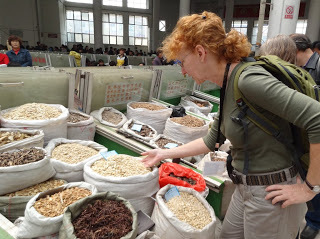 Who can benefit from TCM treatments? A few examples include: Acupuncture with electrical stimulation is used in many veterinary hospitals to stimulate gut motility in post surgical colic patients; herbal therapies help many horses reduce their need for pharmaceutical pain medications with less negative side effects. Acupressure and massage enable many horses to maintain performance, focus and calm in the show ring. Would your horse benefit form TCM? When correctly applied the answer is yes! Traditional Chinese Medicine offers many effective and safe wellness tools for the horse owner and should not be overlooked in the over all health program for your horse.